Carrington lies about one and half miles north of the city centre of Nottingham, astride Mansfield Road and Hucknall Road. Between these two main arteries are shops, factories, and old and new houses. To the east of Mansfield Road is Mapperley Park, a superior residential area first developed in the late nineteenth century. The land slopes upwards towards Sherwood in the north and eastwards as far as Mapperley Plains. Originally the area was in the large medieval parish of Basford, the mother church being St Leodegarius. The parish or, to be correct, the Ecclesiastical District of Carrington was carved out of Basford parish in 1843, when St John’s Church opened. Then the parish boundaries stretched further than they do now, even as far as Woodborough Road. The boundaries of Carrington parish are formed by Redcliffe Road, Hucknall Road, Haydn Road and even Leonard Avenue. Where Sherwood ends and Carrington begins will always remain debateable. 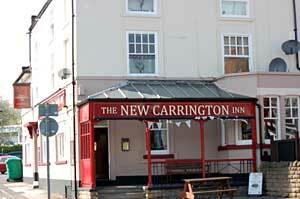 Carrington is now an integrated suburb of Nottingham but until the nineteenth century it did not exist. The old parish of Basford had been enclosed following the Basford Enclosure Act of 1792. Then the open land known as the Lings, rough grassland, was hedged and enclosed into fields which were allocated to various landowners. One of these was Ichabod Wright, the local banker, who lived with his family in Mapperley Hall. He purchased six acres of enclosed land in the acute angle between Mansfield (Turnpike) Road and Hucknall Road, which had been allocated to another banker Robert Smith. Smith had been granted an Irish peerage for assistance he had rendered to Pitt the Younger. In 1796 Smith became Baron Carrington of Bulcote. He later received and English peerage and became baron Carrington of Upton. He later used the title Lord Carrington, a title which had lapsed, and his friend Ichabod Wright chose the name Carrington for the new village. (The present lord Carrington is a direct descendant). The development of Carrington as a village began in 1825. The failure to enclose land surrounding Nottingham before 1845, combined with the textile boom at the end of the eighteenth century, kept the town within a tight boundary. This severely restricted opportunities for building new houses and factories. The pressure of population growth allied to the high rents and industrial development in the lace industry led to the search for suitable building land outside of Nottingham’s boundaries. One such area, came on the market in 1825 at Carrington. The land that Ichabod Wright had purchased from Lord Carrington and adjacent land was sold in 1825. It was freehold land and divided into 40 lots and intersected by streets which were to be 33 feet wide. A plan was set out by the surveyor and architect, William Surplice, who later designed St John’s Church. There was a mixture of housing built in this area. Some large villas were built on Mansfield Road near to St John’s and smaller houses, including some back-to-back houses on Club Row, off Hucknall Road. Only 60 out of the 202 houses built were back-to-back. The houses on Club Row were probably built by a worker’s co-operative and were three-storeys high, with two rooms or more on each floor but the whole of the second floor was for lace machines with light provided by windows ten feet wide on each side of the building. The houses were well built to stand the weight of the lace machines, which was proved when it came to demolishing them in 1962! Carrington was predominantly working-class and continued to expand northwards and by 1851 it had an estimated population of 1,786, double that of 1841 census and was greater than that of Sherwood its northern neighbour. The lace industry was booming in Nottingham and its suburbs in the 1820’s and 1830’s. In 1833 two of the largest lace factories were situated in Carrington. One was owned by Jonathan Burton who owned 43 lace machines and shared a factory with Thomas Sewell, who owned 28 machines. The other was owned by William Astill who owned 33 machines. However, for the workers life was not so good. Conditions in the factories were long and dangerous. Machines in Burton’s factory were operated for 20 hours per day in two shifts, which included children, however, evidence given by the workers suggested that accidents were rare. The owners believed that by restricting the hours would affect them and the workers from foreign competition. Attempts to regulate the hours met with opposition from the owners and in April 1834 a week long strike ended Burton refused to re-admit some of those who had been active in the strike. Burton appears to have disregarded any regulations and in 1874 he still had only two privies for men and women and a foul midden behind the factory. Like all new villages around Nottingham in the nineteenth century Carrington was noted for its religious non-conformity and political radicalism. Here was a good breeding ground for the Chartist movement, which sprang up after the slump in the framework knitting and lace making industries in the late 1830s and 40s. The leader of the movement was Feargus O’Connor, a fiery Irish orator and MP for Nottingham, 1847-1852. Meetings were held on the Forest, close to Carrington, in 1838 and 1839 and after the failure of the petition in 1842 more unrest resulted in a great number of strikers being arrested. The workers put great faith in O’Connor and even paid money into his Chartist Land Company, which was to help buy land for smallholdings for the poor. However, O’Connor mismanaged the funds and the company was closed and many lost their hard earned money. Although lace manufacture was the main employment in Carrington, other work was available. Servants were required in the larger houses bordering Mansfield Road; agricultural labourers were still required as Carrington was still very rural. Carrington had a natural spring and the water was ideal for brewing and Carrington Brewery, established in 1832, produced some ‘excellent porter’. Small scale production continued until 1906 but the brewery had already been taken over by James Shipstone and Company in 1898. John Robinson, the founder of Home Brewery, established a tobacco, cigar and cigarette manufacture on Oak Street, part of Sewell’s old lace factory, in 1885. The old lace factories were reused by smaller employers including timber works, but one of the biggest employers was Hosezene and Company who began as printers but then went to make sanitary towels and were still there until circa 1959. In 1915 there were 15 cycle manufacturers, three of these had premises in Carrington; one of the better known was John Richards who made the Homer Cycle, which was guaranteed forever! However, none of these small businesses required the large number of workers that the lace manufacturers had needed and there was a lot of unemployment. So when the printer Thomas Forman and Son Ltd opened its factory on Hucknall Road in 1926 it was greatly welcomed. The premises were closed in 1999 and the present occupiers are Tesco, the Indian Community Centre and a health club. Carrington in the early twentieth century was a self-contained community, with the Market Place offering all that was needed for day to day life. Shops which had opened on Mansfield Road catered for the middle class population of Mapperley Park. However, many workers had to travel some distance to their place of work, including Nottingham, New Basford, Radford and Cinderhill Colliery. It was fortunate that there had been an important route from Nottingham on the Mansfield Turnpike (now Mansfield Road), through the area of Carrington before the village had been fully established. During the nineteenth century the condition of the road surface was improved and six daily coaches passed through Carrington but it remained unlit and unpaved until 1879. Horse drawn buses had been travelling through Carrington for before the horse drawn trams first plied their route from Nottingham to the terminus and stables near to St John’s Church. In 1882 there was an application from the Tramways Company to use steam power on the Carrington route, this was granted but with such strict conditions about steam, smoke and noise that these experimental vehicles disappeared from the streets of Carrington. They were superseded by electric trams which began running along Mansfield Road in January 1901 from the tram depot at Sherwood to Nottingham Market Square. The trams were well used and attracted many commuters but these too disappeared with the introduction of the motor bus; the last tram was in September 1936. Carrington briefly had a railway station on the Great Central Line from Victoria Station, Nottingham to Sheffield and Manchester, it was opened in March 1899 but closed in 1929, unable to compete with the trams and buses. The station was close to the junction of Mansfield Road, Gregory Boulevard and Nottingham Road. Clawson Lodge was designed by Watson Fothergill in 1885. The predominantly working-class area of Carrington continued to expand northwards throughout the nineteenth century, until, by 1901, it had reached Waldeck Road; Watcombe Circus was not yet developed. Densely packed terraced housing along Hucknall Road was demolished in the 1960s. Much of the property in Carrington today is the better built terraced housing along Loscoe Road and streets off there. Watcombe Circus has some large houses but the ‘handsome villas’, described in White’s Directory are those to be found along Mansfield Road. Amongst these are the last major works by Watson Fothergill, the famous local architect. These are the houses numbering from 409 to 419. The carved animal head at 409 was originally a lamp fitting. Around the corner at 3 Bingham Road is a house designed in 1921 by Fothergill’s assistant Lawrence Summers. At the corner of Watcombe Road is Clawson Lodge, designed by Fothergill and believed to be his finest outside of the Park Estate, and was built for F.A. Doubleday, a lace manufacturer. It is now occupied by the Ukrainian Cultural Club. One property which is worthy of note is at the corner of Church Drive and Loscoe Road. It was built in 1891 and is shaped to fit the narrow corner. It was originally a draper’s shop, then a butchers and was converted into a pottery shop in 1977. Religion played a big part in the lives of the working man and Non-conformists made their mark almost as soon as the first houses were built. A Primitive Methodist Chapel was erected on Hucknall Road and a Wesleyan chapel was built on Wesley Street in 1841, and was later used by Baptists and later as a Bethany Mission. The Baptists, keen advocates of temperance, built a chapel on Sherbrooke Road in 1882. For some years now it has been used by the Mount Zion Apostolic Church. In 1893 the Congregational Chapel was built on Hucknall Road between Alexandra Street and Hamilton Road and later used as the First Church of Christ Scientist. As well as five Sunday Schools in the area in 1914, The Salvation Army bought practical help, such as free soup, to the Market Place during the Depression. In 1843 Sherwood and Carrington were formed into the district of St John’s, Carrington, when the church was built there. Land and money to build the church was donated by Ichabod Wright, a wealthy local landowner and banker. He laid the first stone and the church was consecrated in March 1843. The first baptisms at St John’s were those of children of the labouring classes; the first child of the middling classes to be baptised was in 1849. Nearly all the local residents were buried in the churchyard, although sadly, few of the gravestones remain. The church itself is built in the Gothic structure of the Early English and decorated style. Both Ichabod and his wife who died shortly after the consecration, are buried in the family vault at the church. The Church has always been regarded as a ‘High Church’; advocating a return to the sort of established church which existed before the Reformation. A few years ago the church was significantly redeveloped to provide a new porch, re-arranged nave, meeting rooms, a café and a lift. The first school in Carrington was the National School at the corner of Mansfield Road and Selkirk Street. Although for children working in the lace factories, schooling was sporadic and overcrowded the school was complimented by the School Inspectors in 1846. For many their education came from the Methodist Sunday Schools in Carrington but although some could read many more could not write. It was some twenty years later in 1868 before a school for Girls and Infants was opened in one half of the National School, which then moved to the new St John’s Girls and Infants School which opened in the September. Nottingham City Council Education Committee took over the administration of the school in 1903 until it was closed in 1929. In 1877 Carrington came under the jurisdiction of the Nottingham School Board which was compelled to build a new Board School. 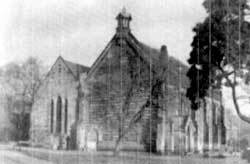 A temporary school was established in the old chapel on Hucknall Road with about 18 pupils. By 1880 there were over 100 children and four classes, showing the need for new premises! Carrington Board School was opened in 1884 at the corner of Hucknall Road and Claremont Road and was one of three schools designed by the architect T C Hine. Girls and Infants continued to be taught separately from the boys, but once again the school became overcrowded and temporary accommodation had to be found in the old chapel again. Over the next few decades the school underwent a series of changes, including a hospital for wounded soldiers in the First World War; when pupils went to Haydn Road Council School in Sherwood and shared the premises with the Sherwood pupils. (See Sherwood). The school became known as Claremont Council Schools and part of it became a Secondary Modern school and later a bilateral school in the 1950s. It later became a Special School and is now a Primary school! Probably the best known educational building in Carrington is Clarendon College, now part of New College Nottingham. Initially set up to provided educational classes for girls who wanted to continue their education after leaving school at 14 years. It became the Advance Club and then the Clarendon Institute. The present building was built in 1960 and offers a wide range of subjects for both day and evening classes. There have been several public houses in Carrington; the three which are still in use are the Gladstone on Loscoe Road, built in 1882, the New Carrington Inn on Mansfield Road on the corner of New Street, built in the 1830s and was supplied by the Carrington Brewery, which stood nearby and the Grosvenor, on the corner of Mansfield Road with the junction of Hucknall Road. Originally known as Black’s Head Inn which boasted beautiful tea gardens, was bought in 1873, by John Robinson, founder of the Home Brewery who changed its name to the Grosvenor Hotel. At that time there was extensive stabling for racehorses from the Forest racecourse. The statue of a horse used to stand on top of the wall in front of the carpark. It disappeared not long after the pub was renamed The Grosvenor in the 1990s, after years of being called Squires! As with many lace workers or framework knitters, cricket was a game that they excelled at and three Carrington cricketers, Day, Brown and Lee, were chosen to play for Nottinghamshire. Old maps show a cricket ground in what is now Mapperley Park, just off Mansfield Road near Tavistock Drive. In 1897 it was used by the Nottingham High School for Boys and then in the 1930s it became the Nottingham City Police Training Ground. 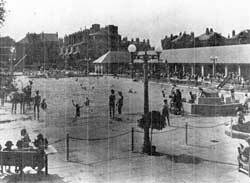 The Carrington Lido in the late 1930s. The children’s play area just off Loscoe Road used to be the site of Carrington Lido which opened in 1937, the site was originally where the horse-drawn tram stables was situated. The Lido cost £20,000 and was very popular during the summer but when the weather was inclement it did not attract enough custom and as with many other Lidos it was thought not viable and closed in 1988. There was a cinema, The Curzon, on Mansfield Road which is now where the Peugeot Garage is situated. It opened in 1935 and was closed in 1958. Mapperley Park on the opposite of the Mansfield Road and situated between Woodborough Road and Mansfield Road stretching from Redcliffe Road to Private Road was part of the parish of Basford and therefore included with Carrington. As a result of the Basford Enclosure Act in 1792 the area now known as Mapperley Park was awarded to the Wright banking family. Ichabod Wright had Mapperley Hall built soon afterwards and enclosed the park planting trees which lasted until the 1920’s. 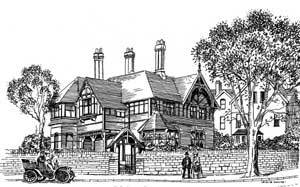 The lodge at the end of Mapperley Hall Drive was designed in 1885 by Evans and Jolley, the Nottingham architects who extended the Hall between 1889 and 1890. Wright owned 150 acres of parkland and arable which was farmed by six agricultural labourers. There were also a dozen servants employed at the Hall. The Hall has had a variety of owners including relations of Ichabod Wright. It has also been used for a variety of purposes. In 1906 the Hall was converted into a men’s hostel for University College, Nottingham. During the First World War it was used as a VAD Auxiliary Hospital for 60 patients; in 1940 it was converted to the Headquarters of No.3 (North Midland) Region for Civil Defence; after the war it was used by the Electricity Board and from 1974 by Severn Trent Water Authority and in 1995 was sold off and transformed into seven apartments. The development of Mapperley Park into a select and well-planned suburb was uneventful, with a variety of Edwardian domestic architecture being erected. The house at 470 Mansfield built by one of the original developers was a Jewish nursing home known as Miriam Kaplowitch House after Miriam Kaplowitch who died in 1972 who had been a director of Jersey-Kapwood Ltd. She was actively associated with local charities and had set up a home for Jewish refugee children during the Second World War. She gave away much of her fortune. Carrington is now very much part of Greater Nottingham with little left of the village it once was, apart from some of the grander houses, the church and a couple of pubs. In the 1960’s large-scale slum clearance took place and even the Market Place disappeared. Recently the original factory buildings were demolished and a residential care home built on the site. It is difficult to separate Carrington and Sherwood other than using Bingham Road as the demarcation point.